MCE Technologies, LLC (MCE) has announced an internal 2x DVD-Recordable drive for the PowerBook G4. In addition to reading and writing to DVD-R media at up to 2x speed and DVD-RW media at 1x speed, the new MCE Internal 2x DVD-R/RW/RAM drive for PowerBook G4 reads and writes with true drag and drop, random-access functionality to single-sided or double-sided DVD-RAM media at up to 2x speed. The MCE Internal 2x DVD-R/RW/RAM drive for PowerBook G4 is bundled with Macintosh DVD authoring and CD burning software and is expected to begin shipping in quantity on August 18. "In addition to slicing DVD-R write time in half, we are bringing a new experience to the PowerBook G4 owner . . . true, drag and drop DVD-RAM data storage for complete random-access, hard drive-like functionality," stated Arnie Ramirez, president of MCE Technologies. The MCE Internal 2x DVD-R/RW/RAM drive for PowerBook G4 writes to 4.7 GB DVD-R media at up to 2x speed, to 4.7 GB single-sided or 9.4 GB double-sided DVD-RAM media at up to 2x speed, and to 4.7 GB DVD-RW media at 1x speed. In addition, the MCE drive writes to standard 650 MB and 700 MB CD-R media at up to 16x speed, writes to standard CD-RW media at up to 8x speed, reads DVD-ROM discs at up to 8x speed, and reads standard CD-ROM discs at up to 24x speed. The MCE Internal 2x DVD-R/RWRAM drive for PowerBook G4 is compatible with Apple's iTunes, Disc Burner and DVD Player applications, and also includes DVD authoring software that enables users to create video DVDs that are playable on most computer and home DVD players. The easy-to-use DVD authoring software allows for customizable menus, backgrounds and even background music in the creation of video DVDs. The MCE Internal 2x DVD-R/RW/RAM drive for the PowerBook G4 also includes Roxio Toast Lite software to facilitate faster and more efficient data DVD and CD recording. The MCE Internal 2x DVD-R/RW/RAM drive is compatible with all 12", 15", and 17" PowerBook G4 models. The suggested retail price is $349 ($389 for 400 MHz and 500 MHz TiBooks). Because of the delicate nature of the installation procedure, installation must be handled by MCE Technologies or by an MCE Technologies Authorized Upgrade Center. A complete list of upgrade centers is located at the MCE Technologies web site. Contact MCE for complete details and product specifications. MacResQ announced today a new PowerBook G4 "SuperDrive" upgrade as part of their PowerBookResQ repair program. The new service offers PowerBook G4 owners an affordable way to upgrade their G4 PowerBook with a DVD/CD burner with PowerBookResQ's famous 24-hour turnaround and nationwide convenience. Owners of the PowerBook G4 (400 MHz to 1 GHz) can now easily replace their built-in CD-RW-only or DVD-only drive with a drive that can burn CDs and DVDs that can be played in most consumer CD/DVD players. The slot-loading "SuperDrive" DVD-R/CD-RW is bootable and compatible with Mac OS X, OS 9, iDVD, iTunes, Disc Burner, and Apple DVD Player, as well as other third party applications. The drive reads at 24x, writes CD-R at 16x, writes CD-RW at 8x, and writes DVD-R/RW at 1x. A 1-year warranty applies. The price for this "SuperDrive" upgrade is only $399 and includes pickup at the customer's location, overnight delivery to the PowerBookResQ service center, expert installation within 24 hours, and return overnight shipping to the customer. PowerBookResQ and PowerMacResQ also offer fast, convenient, and affordable Mac repairs for just $99, which includes 3-way overnight shipping, the initial diagnostic service, and the unique PowerBox, which the customer may keep for future use. For even faster service, same-day pickup is available in most areas of the country. For computer resellers and repair centers, PowerBookResQ and PowerMacResQ offer discounted rates on products and services. Computer dealers can send overflow service work or seamlessly outsource their entire Mac repair operation. Volume discounts are available for schools, corporations, and government agencies. Trans Intl. has announced the worldwide availability of a 1 GB DDR333 (Double Data Rate) memory module for the Apple PowerBook G4 (1 GHz 17" model). Trans Intl's 1 GB memory modules double the system's main memory in Apple 17" PowerBook (1 GHz G4 Models) to 2 GB of RAM. This makes the PowerBook equal in memory capacity to the current desktop Power Macintosh computers. As the number of Macintosh users looking to replace desktop models with slim PowerBooks grow, Trans Intl. DDR333 modules provide PowerBook users with desktop-like power by offering 1 GB of memory density for each memory expansion socket. The 17" PowerBook has two memory expansion sockets for main memory expansion. Trans Intl. memory modules conform to Apple's stringent electrical and mechanical design guide lines. The 1 GB DDR333 Memory Module operates at a clock rate of 166 MHz and transmits data at 333 Mbps. 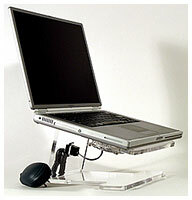 MacMice announced the iPerch Plus fan-cooled acrylic PowerBook desk stand. The iPerch Plus is a 5.5" tall clear acrylic desk stand that holds any model Apple G4 PowerBook at a 15-degree angle, for improved screen viewability when in desktop usage. The product includes an innovative PowerBook cooling system, based around a clear 80mm acrylic ball-bearing fan, coupled with proper air ducting between the product and the PowerBook. The iPerch Plus creates an average PowerBook surface temperature reduction of between 15° and 30° Fahrenheit. It does this by pouring a constant stream of room temperature air upward into a carefully chosen open space between the clear polymer bumpers on the top of the iPerch Plus and the bottom of your PowerBook. This spacing determines the distribution and velocity of the cooling air flow and is precisely matched to the uniquely designed fan system. The result is simply an incredibly efficient cooling mechanism for your overtaxed PowerBook. MacMice says that their test PowerBook's noisy internal cooling fan never cuts in while running on the iPerch Plus - even under heavy use. The product creates only 20 dB of sound at 2' distance, which is extremely quiet. MacMice claims it is the quietest fan-powered laptop cooling product on the market. This low operating noise level makes the product uniquely suited for use in audio or video production settings, classrooms, meeting areas, or other areas demanding maximum quietness. The low noise level was achieved by running the large-bladed (80mm) fan at a lower DC voltage than its designed operating voltage. By using a lower voltage, the fan runs slower and makes less noise. However, MacMice had to make certain that the fan used would always develop enough torque to start and run properly at the lowered voltage, as well as continue to operate properly for many years. The uniquely precise ball-bearing fan used meets these requirements. The iPerch Plus is specifically designed for Apple's G4 PowerBooks, and works with the 12", 15", and 17" models. It also works with Apple's "ice" iBooks, both 12" and 14" models. The iPerch Plus is fabricated from 3/8th inch Acrylite brand clear acrylic material and is specifically designed to be stable enough to type on, should you choose to do so. Your PowerBook will rest on four clear soft-polymer bumpers that raise your notebook up above the product's surface just enough to enable proper air flow between the top of the iPerch Plus and the bottom of your PowerBook. The iPerch Plus is available now for US$69.99 from the MacMice website. Use the Dexia Rack on your desk with a secondary keyboard and mouse for a heads-up display, with your laptop raised 7.6". The Rack straddles full size keyboards - the legs spread to 20.6". 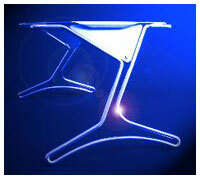 The sculpted legs allow you to reach for the mouse without bumping the frame. The Dexia Rack frame is made from aircraft-grade aluminum welded in 16 places, with diagonal flexible steel cables, and finished in 4 available colors: blue, black, gold, and aluminum. The top surface is a generous 10" x 13" to handle virtually any size laptop and has a large bottom opening for heat dissipation. You can take the Dexia Rack to bed, the floor, a sofa, or out on the lawn. Currently the Dexia Rack is only available directly from Dexia Design or through major U.S. college bookstores and campus computer stores. When open, the Back Office from Shaun Jackson Design becomes a comfortable, well organized, portable workplace for your lap or desk. The side pockets hold all of the computer's accessories, making them easily accessible. A DVD/CD organizer panel sits just behind the screen. The padded, contoured shoulder straps can be discreetly stored in there own zipper pocket. A single shoulder strap may be attached at the D-rings located on the top of the case for the times that a backpack may not be appropriate. The horizontal configuration of the case makes navigating crowded and cramped areas such as busy hallways or airlines a walk in the park. A second rear pocket provides ample room for paperwork, a portable printer, or even a second laptop computer. Big BackOffice accommodates larger laptops like the 17" PowerBook. Trans Intl. earlier this month released the fastest 2.5" drive (7200 RPM) for PowerBooks, iBooks, and notebook PCs. The drive is available as an internal drive upgrade and as an external portable drive with dual ports for easy connectivity, FireWire 400 and USB 2/1.1, making portable computers equal in storage I/O performance with desktop systems. StarBand, a high-speed, two-way satellite Internet provider to residential and small office customers, has announced the national expansion of the StarBand 480 Pro service with a professional-strength, network-ready, business-grade satellite modem delivering faster speeds, instant networking capability and compatibility with a wide array of computer operating systems including Windows, Macintosh, Unix, and Linux. The StarBand 480 Pro provides high performance Internet service with peak download speeds of up to one megabit per second (Mbps) and upload speeds of 100 kilobits per second (Kbps) in Turbo Mode, which is available for most large file uploads. "We committed our time and resources to delivering this highly demanded solution to the marketplace and are now ready to fulfill the pent-up demand for it," said StarBand Chairman and Chief Executive Officer Zur Feldman. "The StarBand 480 Pro, our fourth generation product, shows once again that StarBand listens to the customer and delivers on their needs." "StarBand has a history in being first to market in this category and today we are doing so again with the StarBand 480 Pro," said Howard Lossing, VP of Sales and Marketing. "Our commercial customers asked for, and we delivered, a product that works with all operating systems, has faster upload speeds, includes a built-in router making networking easier, offers multiple static IP addresses, and does not require PC-based software." The initial limited rollout to several hundred customers in the First Quarter of 2003 resulted in very high customer satisfaction with more than 90% claiming they would recommend the StarBand 480 Pro Small Office service to other businesses because of its reliability, faster upload speeds and networking ease. The StarBand 480 Pro satellite modem includes a four-port Ethernet router enabling instant networking of multiple personal computers to provide maximum flexibility for networked environments. With the product software and intelligence now embedded on the satellite modem, business customers with Windows, Macintosh, Unix, Linux and many other Operating Systems supporting TCP/IP can enjoy networked high-speed Internet access from StarBand. FireWireDirect has announced the introduction of the first in a series of new 800 Mbps external hard drives and enclosures with the debut the StingRay 800, a powerful dual interface USB 2.0 and FireWire 800 3.5" desktop hard drive storage system. FireWire 800, or 1394b, is a new, faster FireWire standard rolled out in highly anticipated new products from FireWireDirect. The improved standard offers dramatically increased speeds and enhancements that will be immediately attractive to digital video and audio producers, multimedia creators, and every personal computer user demanding cost effective and speedy storage for the digital life style. FireWireDirect was first to market with several 800 Mbps products, and the StingRay 800 is their first storage offering, available in up to 320 GB in a single volume and already offering the huge speed gains promised by the new standard. Most users will see sustained reads of over 50 MB/s and writes of over 40 MB/s, about double the possibilities of traditional FireWire. Like all FireWireDirect products, the drive plugs and plays without special drivers. The dual USB 2.0 FireWire 800 interface enables it to connect to virtually any computer. The drive separates itself from the pack with a whisper quiet fan for efficient and noiseless cooling, and a built-in power supply &endash; no bulky power brick cords. These and other attributes make the StingRay a powerful 800 Mbps FireWire solution that's especially attractive for mobile personal computer users. The drive is available and shipping now, in sizes ranging from an Enclosure Kit for users building their own, to the huge 320 GB HDD, the only single volume FireWire 800 external drive of this size available to consumers. The StingRay 800 is a truly cross platform solution, complete with software for both Mac and Windows users.